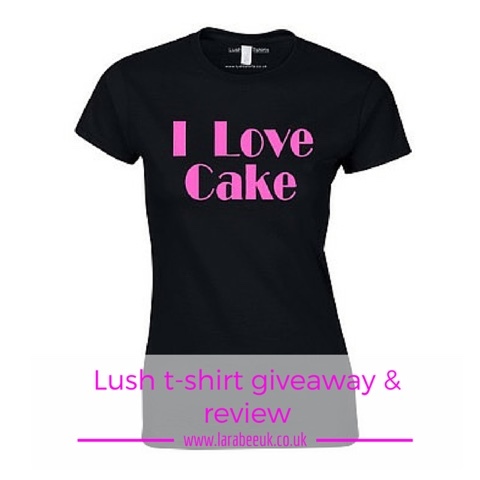 I was recently invited to try and review a fab slogan t-shirt from lush t-shirts, it took me ages to decide on a slogan as there are so many I loved. I finally decided on a hot pink and black 'I love cake' t-shirt. The t-shirt is really well made, of great quality and the most fantastic and vibrant slogan. My photos couldn't do it justice so I took this one from the website. They are well worth the £14.99 price tag. There's a great line of festive T-shirts, with clever, funny and Christmassy slogans, I'm sure you could find something for all the family and use their 4 for 3 special offer!! Like a complete wally, I ordered small not medium and so my loss is your gain! I'm offering the T-shirt in a giveaway, but please remember when entering THIS IS FOR A SMALL BLACK T-SHIRT ONLY. 5. Winner will be drawn 1 December 2015 and has 7 days to respond, after which the giveaway will ever re-drawn. Disclaimer: I was sent a complimentary T-Shirt for this purposes of this honest review.